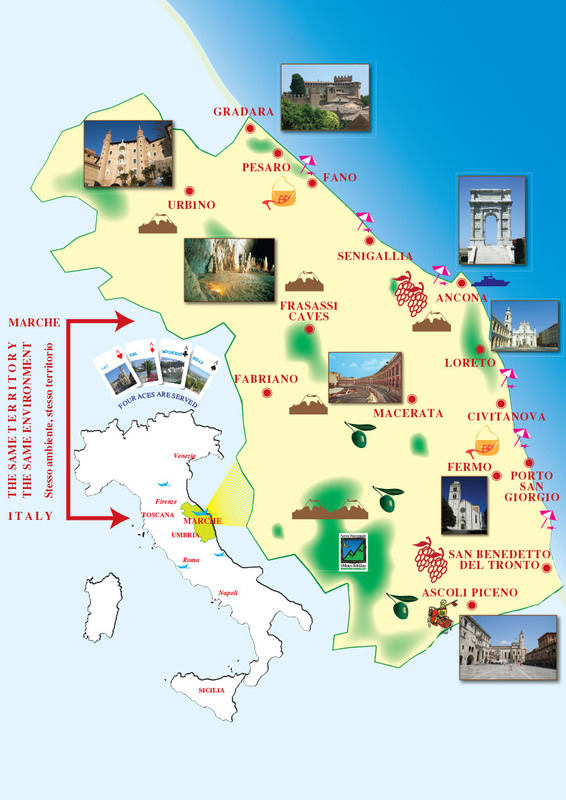 Fano thanks to its strategic location is the ideal starting point if you want to discover flavors and colors of 'hinterland is that Marche Romagna ! Just get away from the coast a few miles to travel through time and find yourself among castles , abbeys , ancient places rich in history and traditions . And then a little 'shopping never hurts , just a few miles from us you can find the best brands made â€‹â€‹in Italy around the most glamorous stores or in the various outlets and factory stores closest to us. dell ' year : many wine tours to discover the vineyards of land and farms Km Zero . Fano : it was known as Fanum Fortunae , name that refers to the Temple of Fortuna erected to witness the defeat of the Carthaginian army in the battle of Metauro . Retains many traces of its history : the walls , constructed by Emperor Augustus, the monumental Arch of Augustus which was the main access to the city ; Malatesta Fortress , the Court and the Tombs of the Malatesta testifying another important chapter in the history of the Fano Malatesta . Guided tours by reservation in different periods of ' year . Cartoceto : has a historic center of great value with the lovely Piazza Garibaldi , a former market square , where stands the Palazzo del Popolo , with the small clock tower . The city is also a center for the production of extra virgin olive oil , where it operates an authentic olive press where you can watch the entire production process . Gradara : a few miles from Fano we find a medieval fortress protagonist of many historical and cultural events . The city with its impressive fortress is surrounded by a double wall within which is contained the medieval village and castle , famous for the tragic love story of Paolo and Francesca narrated by Dante Alighieri in the fifth canto of the Divine Comedy . The Castle is definitely one of the most important , best preserved and most visited in Italy . The penultimate weekend of July you can witness the charming historic reenactment of the castle took place in 1446 . Urbino : the historic center is a UNESCO World Heritage . The city that from a distance you can see to the spiers of its towers , is a small, picturesque , characterized by medieval and Renaissance architecture , and is one of the university 's most famous and oldest in Italy . To visit: the Palazzo Ducale , the House- Museum of Raffaello Sanzio where you can admire a fresco , the environments and the vessels of the Urbino painter , the Cathedral , the Monastery of Santa Chiara , the National Gallery , the Oratory of San Giovannie l ' Oratory of St. Joseph , the many churches , the Academy of Fine Arts , the Albornoz Fortress and more . Park San Bartolo and ' one of the four reserves of the Marche region that covers the whole ' area between the towns of Pesaro and Gabicce . It ' a charming hilly course overlooking the sea to cross on foot , bicycle, motorcycle admiring the view. Furlo and Aqualagna : the first is located along the old Flaminia immersed in the nature reserve of Furlo Gorge . In the past it was a ' stage also appreciated by Mussolini , which can be seen on the rocks the " Head of the Duce " built in his honor by the militia National Forest . Near there Aqualagna , a small town famous for centuries for research and commercialization of truffles . San Marino : the Republic is the world's smallest . The historic center of the independent state , has a beautiful medieval town rich in monuments , characterized by picturesque alleys , where you can admire panoramic views , the sea and the whole coast on one side and the inland dall'altro.Da not miss: the Palazzo Government , the Basilica , the Church of San Francesco , the three fortifications on the edge of Mount Titano and several musei.La Republic of San Marino is the oldest republic in Europe. Frasassi : discovered in 1971 , the result of the slow work of nature , are considered among the most beautiful caves from fans and tourists . Plots of tunnels and caves make the path inside the caves an exciting and evocative . Inside the cavities formed in the course of 190 million years , sculptures naturaliche have inspired the imagination of many cavers , and beyond. The caves winding underground for about 18 km within the Regional Park of the Red Gorge and Frasassi . Loreto : the urban center of Loreto has formed around the shrine . The history of this sanctuary began in 1294 when the Holy House of Nazareth , (the house where the Virgin Mary received the Annunciation ) , arrived in Loreto . The Sanctuary has been and still is one of the most important pilgrimage sites for Catholicism . Conero Riviera : Portonovo and ' the first bay of the Riviera leaving from Ancona , a charming bay surrounded spelndidi glimpses of nature. Sirolo instead ' a beautiful medieval village between the green of Mount Conero and the blue of the Adriatic Sea . Is in fact considered " the pearl of the ' Adriatic " . 2 km from Sirolo Numana are narrow around the harbor. Its spectacular staircase the " costarella " was the ' old road access for fishermen to the sea , which connects the old town to the harbor . Jesi has very ancient origins . The territory was settled numerous times : by the Etruscans and Gauls , from barbarous nations fell from North and Picenes and was later a Roman colony from 247 BC (ancient Aesis ) . The city is located on a small hill and for that you can see from afar the fourteenth century walls built on the route of the Roman walls that enclose the old medieval . Must see : the center with the Castle , the Art Gallery , Teatro Pergolesi and the Regional Wine . Jesi is rich in architectural , ancient palaces , and churches . Perugia : the city of Perugia , which stands in the center of Umbria , has an ancient history dating back to the ancient Etruscan civilization . The city offers many things to see. Do not miss the Grand Square ( Piazza IV Novembre ) with the Palazzo dei Priori , the Cathedral , and in the center the Fontana Maggiore ; the National Gallery of Umbria , the Collegio del Cambio and that of Merchandise. Testimonies of its ancient origins are the Etruscan Arch , Porta Marzia and the Etruscan Well .